On the CBS hit show Survivor, contestants do some pretty disgusting things to make it out of the wilderness — like eat insects. It's too bad that the Donner Party (early American pioneers making a trek out west who were caught in the mountains of California and turned to cannibalism) had to go through a horrific slow starvation that U.S. history records so famously and then proceed to actually eating their dead loved ones rather than seeking out insects and or the other creatures we mention below. With shows like Survivor in recent years, television has desensitized a lot of us to the idea of eating insects. I mean, for example, let me ask this question: Are you willing to eat insects? Could you get your family and friends to eat insects in a survival emergency, if it came down to it? Although Survivor over dramatizes the plot lines, the fact remains that surviving extended periods in harsh conditions requires you to make some tough decisions that may include whether or not to seek after and eat various insect species in order to survive and live another day, week, or even month, if insects were all you were able to get your hands on. Many people — especially those of us that live in North America — shake our heads in disgust at the thought of eating insects. However, the feeling of disgust dissipates as the hunger pangs grow stronger. We're used to consuming three substantial meals a day, sometimes more than that, with one or more snacks filling in the caloric schedule throughout the day. When would you retire your entrenched belief that consuming insects represents one of the most distasteful things that you can do? North Americans despise the notion of consuming edible insects, but the fact remains that nearly 80 percent of the world's population includes insects in their daily diets. In some cultures, edible insects comprise the appetizer, entrée, and dessert. Yes, consuming edible insects requires the development of an acquired taste. Yet, who said you have to go all in and ingest copious amounts of crickets to prepare for the inevitable prolonged disaster. 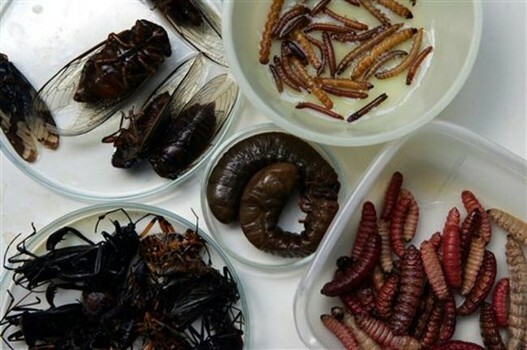 In a survival emergency, realize that you can safely eat many types of insects as well as other creatures like snails, maggots, and even slugs. Each of these can also be considered as a food source — though they should be found in the wild, not near any area of possible industrial pollution or agricultural contamination or even near a neighborhood due to the widespread use of chemicals aimed at killing these commonly viewed "pests". Any snails, slugs, or maggots that you do find in the wild should always be cooked thoroughly to kill any bacteria and parasites — more on this below. In a survival scenario, you can't afford to be picky to sustain your body and mind. Not only does Jimmy John's not deliver Freaky Fast in the wilderness, you might also not have a way to hunt or trap wild game or forage for wild edibles. Just depends on where you are, what season of the year you happen to be in, and whether or not you have any traps or ammo to go after a wild animal. And that brings us to insects, as well as snails, maggots, and slugs — which are not insects, but we mention them here because they are a possible food source often found in the same places as insects and commonly looked at with the same disregard. But why go hungry in a survival emergency when literally at your feet could be your next meal, and it might not be as bad as you think. At some point creatures like these may become your only option to survive other than cannibalism and we hope that you and others would never consider that, especially when insects are so readily found. On top of that you have 15 varieties of insects and those snails, maggots and slugs to choose from that are easy to capture and provide nutrition and calories to help you get through the day and week ahead. Edible crickets and edible grasshoppers – – Crickets and grasshoppers provide abundant calcium. The easy to catch insect also contains 20.6 grams of protein for every 100 grams of insect that you consume. Most of the nutritional value of crickets and grasshoppers comes from the torso area. Although the legs and wings do not possess much nutritional value, you might want to consider mixing the parts in with the torso to add a crunch to each bite that you take. The crunch effect makes consuming the insects more palatable, which means you should pull the legs and wings off. You can consume crickets and grasshoppers either raw or cooked. Crickets live under rocks, boulders, and large logs that sit near meadows and fertile pastures. The nocturnal insect's cousin the grasshopper prefers more arid and open living environments like meadows and fields, where ever grass is plentiful. Learn specific details about crickets here and learn specific details about grasshoppers here including as edible insects. Edible locusts – Similar to crickets and grasshoppers, locusts also contain rich amounts of calcium and protein. The primary difference between locust and their insect cousins involves size and the fact that locusts travel in swarms, which makes it easy to build a large inventory of locusts for surviving prolonged emergencies. In many parts of the world, locusts comprise a diet and nutritional staple. Residents of Sub-Sahara Africa sweep swarms of locusts into bags. Locusts migrate all over the world, mostly between regions that have fertile soil to grow plants and trees. Edible ants – The hardest working insect repulses many people for consumption, but ants are easy to find and capture. Some ants, such as fire ants, bite and thus, don't make good food sources. To catch and round up ants, dig into an anthill and use a large scoop or scoop-like device to push the ants into a container. Most survival experts recommend boiling ants, but before doing so, you need to shake the container to remove any dirt and mud clinging to any ants. Eating ants raw creates a bitter vinegar taste that boiling in water removes. Three and a half ounces of red ants produces 14 grams of protein and 5.7 milligrams of iron. The 5.7 milligrams of iron represents about 71 percent of what men require each day. Women receive more than 33% of their iron needs from a 3.5-ounce serving of red ants. Edible beetles – As a common insect species, June bugs are beetles (Phyllophaga is the technical name for this genus of beetles) and thrive in arid climates, such as climates found in Denver, Santa Fe, and Phoenix, but beetles themselves can be found in many regions. Depending on where you live, you may have come across these for several years, thought they were simply beetles, but now you have a specific name for this species of insect, June bugs. This slow moving insect requires little effort to catch and the reward is a tasty snack or meal after grilling or slow boiling the insects over a fire. Sometimes June bugs hardly move at all. You find June bugs on plants during the late evening hours and under plants and along the forest floor during the day. At 13.4 grams of protein per 100 grams of June bug consumption, you receive an ample amount of protein as they are found and consumed. Edible caterpillars – A hairy insect doesn't seem an epicurean delight, but caterpillars contain high levels of iron, niacin, protein, thiamine, and B vitamins. Some types of caterpillars are not fit for consumption and we discuss the common traits to look for in unhealthy insects at the end of this article. Many survival experts suggest frying caterpillars to harden the crunch. The low moving and easy to catch insect also goes down gullet raw. In some parts of the world, some types of caterpillars are a rich food source. However, please note, that some caterpillars are toxic to humans, and to rely on caterpillars as a food source in a survival emergency, please seek out more specific instruction for caterpillars in your region. Edible scorpions – Found in the desert regions of the American southwest and open, rugged frontier across states such as Texas, Arizona, New Mexico, and parts of California, scorpions are the quintessential insect to raise and harvest for later consumption. Search for small holes under rocks, trees, and tree limbs. To avoid the painful scorpion sting, use a glass bottle and push the scorpion into the bottle. Cooking scorpions involves skewering the large insect and holding the skewer over an open fire. Because of a high concentration of protein, several body building supplement products use scorpion extract to enhance protein content. Since scorpions live in rocky environments, you also benefit from a strong source of minerals, such as iron and magnesium. Edible termites – Your body needs protein to build and repair skin, bones, muscles, and most important blood oxygen, and termites are rich in protein. If you can find a termite mound, you may be able to feed several people at just one sitting. During any prolonged emergency, you can expect your body to undergo considerable duress. Termites come to the rescue, because the oft-maligned insect contains an abundant 14.4 grams of protein for every 100 grams of termites that you consume. Anyone that has been the recipient of termite destruction knows where to look for the body-repairing insect. Termites flourish within downed trees, as well as decaying stumps and logs. You have to eat a large amount of the tiny insect to enjoy the protein benefits, but termites typically are found in hordes. Termites live in damp climates in regions such as thick forests and coastal areas. Many natives to termite country eat the insects raw to obtain the highest nutritional value. Edible snails – No, you don't need a slab of butter, cup of white wine and a few shallots to enjoy what the French call escargot. Snails tend to consume toxic fungi and vegetation, so the best way to consume the easy to catch Gastropod is by steaming the entire shell and then removing the tender body from the shell. Harvesting snails only requires a container that contains the traditional grain feed that snails like. The snail population explodes during the spring, when food sources rapidly multiply. One hundred grams of snails gets you over 16 grams of protein, which represents a protein number near the top of the insect consumption list. The same amount of snails provides 90 calories and about four milligrams of iron, which equals the iron produced from a six-ounce serving of beef. Edible centipedes – Found throughout North America, centipedes are one of the most abundant forms of insects for consumption — and they're typically easy to find. Especially after a steady rain, turn over a large log or rock and discover several centipedes scampering away. Remember that besides possessing fewer legs than millipedes, centipedes also differ from their leggy cousins by not emitting toxins. Since centipedes use pinchers to bite, the best way to consume the nutritious insects is by boiling or steaming them. A serving of 100 grams produces a healthy 160 calories and 36 grams of carbohydrates. For survivalists that need a sudden burst of energy, centipedes should comprise one of the go to insects for consumption. Edible cockroaches – Stay away from cockroaches that swarm into dark spaces within your home — we're talking about cockroaches found in the wild. During an emergency, where you are nowhere near your home and there is no food available, be on the lookout for wilderness cockroaches that feast on highly nutritious fresh fruits and vegetables. Cockroaches love damp environments, especially those that bustle under the cover of darkness. The clean and delicious wilderness cockroach taste and feel like greasy chicken say many who have eaten them, but you must boil, fry, or sauté the insect to achieve the greasy chicken taste profile and definitely to kill any bacteria that may be present on a cockroach. Adult cockroaches produce 23.80 milligrams of vitamin C and 48.16 milligrams of vitamin A. You also benefit from an incredible 65.60 grams of fiber by eating just 100 grams of cockroaches (which you'll get in just a handful). Edible bees and edible wasps – – As an elusive insect to capture, buzzing bees and wasps often zip in and out of view hundreds of yards from where their bustling nests hum, where bees are busy at work serving the hide. Yet, the effort put into locating the home of bees and wasps is well worth the survival effort. Some survival experts suggest tying a thin, long silk thread to a captured bee or wasp and then follow the bee or wasp to its buzzing home. The way to drive bees and wasps away from the nest is to smoke them out. Once the bees and wasps flee, you have access to delicious and nutritional larvae. Smoking bee or wasp larvae for several hours represents the best way to ensure robust flavor, without diminishing the nutritional content of the edible insects. Bee pollen is replete in protein, folic acid, B-complex vitamins, and free amino acids. Edible earwigs – Many survivalists prepare earwigs the same way that they prepare termites. However, gardeners have found that a capture method makes the prefect food preparation method as well. You fill low-sided cans with about a half-inch of vegetable oil and set the cans on the ground, preferably near vegetation. Earwigs detect the presence of vegetables and move inside the cans, where they drown. The dead earwigs already have a coat of oil for frying or toasting. Stale beer works almost as effectively as vegetable oil. Earwigs offer a substantial source of protein and fiber, something that many survivalists lack by living days or even months outdoors. Edible maggots – Revolting as they are, maggots might be one of the few insects that you find during an emergency. Rotting animal corpses produce copious amounts of maggots and the fat content alone helps you survive food deprivation. Many cultures crave the superfood maggot to counter the long-term health detriments of consuming a lean beef diet. Maggots offer the protein and carbohydrates that survivalists need to sustain themselves both physically and mentally during an extended emergency. Edible slugs – Slugs possess many of the same nutritional benefits offered by their cousin, the ponderous snail. Rich in minerals that maintain healthy blood flow and oxygen, slugs also deliver the protein required to keep a brisk pace during survivor mode. Abundant during the rainy season in any North American climate, slugs require little effort to acquire. Simply look under damp vegetation and timber to find the slow moving insect. Never eat slugs raw, as they contain a potentially harmful parasite that can kill you. Cook slugs thoroughly the same way that you prepare snails, except you don't have to remove the body from the shell. Edible beetles – Though we discussed June bugs earlier in the article, it's worth going into more detail on beetles as a whole as many are edible and easily found. A giant water beetle produces around 20 grams of protein on just a 3.5-ounce serving of the crunchy insect. One 3.5-ounce serving of the palm worm beetle generates almost 14 grams of protein. Beetles of all species supply you with more than enough iron, zinc, and calcium to thrive during a prolong stint living in the wild. You can find beetles in the same places that you find many of the other edible insects on this list: under fallen tree limbs and other timber that sit in damp conditions. To cook beetles properly, skewer the insects on a shaved stick and slowly roast the bugs over an open fire. Many survivalist experts recommend crushing the bodies and sprinkling the insect over other types of food. The top 15 edible insects represent just the tip of the iceberg. Other lesser-known insects offer many of the same nutritional benefits. For example, many species of spiders provide sustenance during difficult times. Remember that many cultures adhere to diets that include insects or exclusively use insects to provide nourishment. You don't have to be in desperation mode to enjoy edible insects. Like most acquired tastes, it takes a little time to integrate insects into your outdoor diet. Although each species of insect present varied edible warning signs, a few general rules apply that should keep you safe during an emergency. Survival experts state you should avoid insects with bright colors such as red, orange, and yellow. Some insects flash the bright colors to thwart attacks by predators, but to ensure your health, avoid the bright colored insects. If you want to maintain your health, stick with insects that wear green and brown. Insects that emit a strong odor typically are not safe to eat. You should also avoid insects that live near farms and outlying rural neighborhoods, as pesticides make the insects a terrible option for obtaining calories. Insects tend to snack on food sources that leave us a bit sick, after consuming the insect raw or cooked. The way to avoid coming down with insect caused nausea involves not only slow cooking edible insects, but also taking steps to harvest the insects for consumption. Virtually every North American edible insect should spend some time fattening up on grain for a couple of days to clear out the remains of potentially harmful feed in their systems. You can easily build a small cage from twigs and sticks to keep the edible insects from running away. Survivalists don't have the tools used by professional insect harvesters out in the wild, but you'll find enough natural "supplies" in nature to make edible insect harvesting during an emergency easy to accomplish. Emergencies never knock on the door and tell you when they're coming. The calm, sunny day that you enjoyed today can easily transform into a raging crisis tomorrow. Adept survivalists know how to prepare for the inevitable emergency. However, some emergencies unfold over extended periods that exhaust most, if not all of the food sources collected to prepare for the cataclysmic event. Ensure your long-term survival by knowing which insect to eat that provide the nutritional sustenance you need to live during desperate times. To learn more specifics about edible insects, consider Edible: An Adventure into the World of Eating Insects and the Last Great Hope to Save the Planet by Daniella Martin available in hardcover, audio book, and digital format. Though many insects and other creatures mentioned are edible and can help you survive, as mentioned some are toxic or have dangerous bacteria or parasites present, and to really consider any of these as a viable food source it really is worth reading more on and developing experience with hands on practice.